Do you spend way too much time managing schedules, jobs, and accounting for your business? Smart Service field service management software can help! 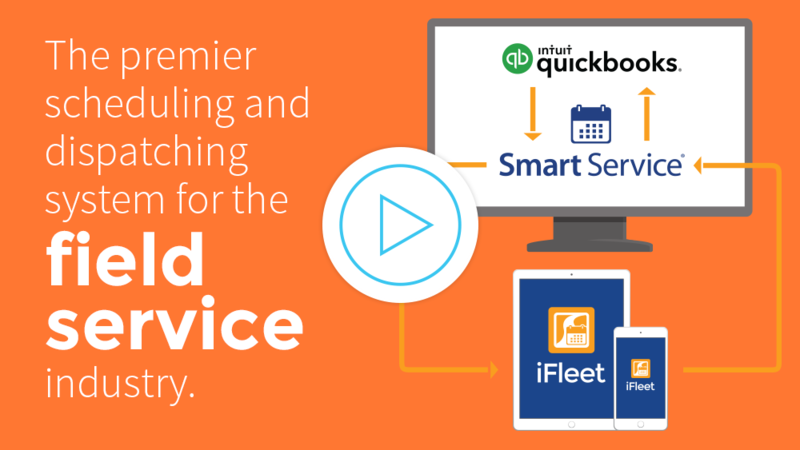 Smart Service works with QuickBooks to provide an integrative field service experience. Tired of spending hours trying to log invoices and handle billing? QuickBooks is great, but Smart Service can make it even better. Seamless integration allows your field service management office to function just as smoothly. Spend less time logging the same information over and over, and spend more time creating business for your field service business. Learn more. Hate trying to optimize your technicians’ schedules? Smart Service scheduling software takes control by easing interaction between the office systems and your technicians on the job. Invoices are created automatically—just another thing you won’t have to worry about anymore. What if I told you that it’s possible to grow your business and save some trees as well? Use Smart Service software, and get rid of all your paper forms and receipts. Using Smart Service mobile apps allows your field service team to receive payments, take notes, and conduct business in the field! Learn more. If you use QuickBooks and are in a service industry you would definitely benefit from this program. Find out how Smart Service field service management software will simplify your business functions! Field service management business tips and tricks.